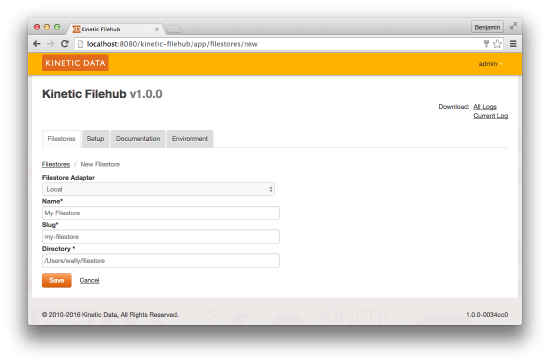 Optionally configure the applications data directory to store configurations outside of the kinetic-filehub webapp (this will make future upgrades much easier). Navigating to the Setup tab allows you to edit configuration details for the Bridgehub console. The Configurator Username and Configurator Password allow you to modify the username/password combination that is needed to log into the Filehub Admin Console. Log Level allows you to choose how verbose the logging will be. Log Size (MB) is the size that the Current Log is allowed to be in MB. Filestores are instances of Filehub adapters that are configured to point to a specific datastore. Multiple filestores can be created in Kinetic Filehub to expose different datastores with different access credentials. From the Filestores tab of the admin console click the Add Filestore button. Select the desired filestore adapter. This example is for a Local filestore. Name is a friendly label used to list filestores in the admin console (example: "My Filestore"). Slug is a unique identifier used by integrating applications to select which filestore to connect to (example: "my-filestore"). Directory specifies the fully qualified path to where file should be read and written to (example: "/Users/wally/filestore" or "C:\Users\wally\filestore"). Filestore access keys are needed for integrating applications to sign requests to Kinetic Filehub filestores. These keys are generated for each filestore from the admin console. From the Filestores tab of the admin console, click the Edit link for My Filestore. Click on the Add Access Key button. Enter a short Description of the access key (example: "Kinetic Request CE" or "My Integrating Application"). Copy the Key and Secret values, which will be necessary for the application to create signatures. The Filehub admin console provides a browser for navigating a filestore. This browser is typically only used during integration development or for troubleshooting, and in this case can be helpful to verify that the Filestore has been set up correctly. From the Filestores tab of the admin console, click on the My Filestore name link. Use the Upload Files form to upload a test file to this directory. To open or download the file, click on the file link. To delete the, click on the Delete link. Configuring Filehub clustering allows multiple Filehub instances to be running with the same exact configuration. Any time an update happens in one Filehub instance, the other Filehub instances that are running in that cluster will automatically update the configuration details that changed. This cluster support makes it easier to run a load balancer among multiple Filehub instances. This clustering is accomplished by storing the configuration information in a Cassandra database and then having each Filehub instance poll for changes that happen on other instances in the cluster. To setup Cassandra it is recommended to either use cqlsh (a command line program) or DevCenter (a GUI program). There are multiple way to create a keyspace in Cassandra, so no one example will universally work for all environments. The following are a couple examples labeled with what situation they are used in. Restart any tomcat instance that java properties were added to - the changes won't take affect until restart. Structured logging essentially is ensuring that a log file is a preset, consistent, and machine readable format. Structured logs are useful for enterprise log aggregation tools like Splunk, Graylog, or Elastic. The Filehub BMC® Remedy® Ars Adapter provides the functionality necessary for Kinetic Filehub to read and write files into Ars entry file fields. The Filehub Cloud Adapter provides the functionality necessary for Kinetic Filehub to read and write files into common cloud services such as Amazon S3, Microsoft Azure, and Openstack Swift. The Filehub Local Adapter provides the functionality necessary for Kinetic Filehub to read and write files into local directories. These directories may correspond to storage attached to the webserver or to shared storage mounted by the webserver. The Filehub Microsoft SharePoint Adapter provides the functionality necessary for Kinetic Filehub to read and write files into a Microsoft SharePoint Document folder. In order to leverage Kinetic Filehub, an integrating application will need to generate pre-signed requests. The Java code snippit below shows an example using the Guava library (google commons) to generate the signed URL.